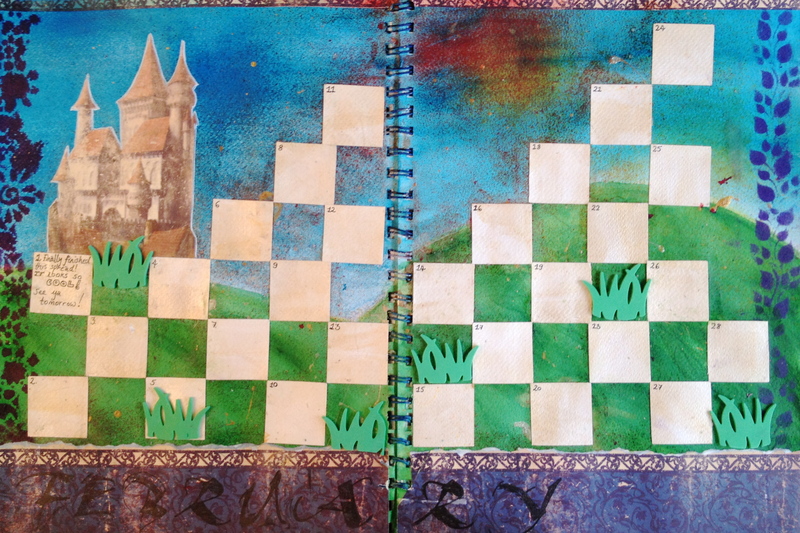 I’ve only just discovered Kate Crane‘s wonderful Art Journalling Calendar Challenge. She is an inspirational teacher and has done some great Youtube videos and DVDs, so check her out. I missed January’s challenge, but with my carer/art therapist Mary-Ann, we’ve just finished a calendar spread for February, and I’m rather pleased with it, even if I do say so myself. I don’t know where the idea for a background of green hills and blue skies came from – it all looks very sunny and optimistic, given we’re just out of January snow and into the biting cold of February. Anyway, it’s a slight contrast from my previous piece which was an angry red spread on getting through Tough Days and believing in better things to come. I’ll post that soon. Husband did a nice job, for an art baby, with the Nicolson’s Peerless Transparent Watercolours on the green hills. The sun is a Dylusions ink spray, a Christmas gift from that nice Paula Watkins (thank you!). I’m very happy with its also impressionist look and colour. Stencil patterns down both side are Dylusions stencils c/o Art from the Heart. The castle is from some scrapbook papers I’ve had lurking around for a few years, from a set called Once Upon a Time I ended up using on my wedding album (some 8 years after we got married). The tufts of grass are sheets foam cut by QuickKutz. The calendar squares are punched card stock from the archive. It was a labour of love that took us the best part of two days to complete, all to a soundtrack of old skool 80s music. I think it must be the Carrie Diaries that has got me back into the 80s, and now I’m passing on my wisdom to Mary-Ann about what real music is. She’s still finding out about the Communards and Bronski Beat…. I mean, come on people, it’s 1986, so Don’t Leave Me This Way!